The Global Forum on Migration and Development (GFMD) is a "new initiative of the international community to address the migration and development interconnections in practical and action-oriented ways." However, many feel that the Forum is used so that officials can make top-level decisions outside of the framework of the United Nations - without community engagement and oversight. This year, the GMFD is being held in Manila. But, hundreds of organizations from across the globe have organized a "parallel event" called People's Global Action on Migration, Development and Human Rights (PGA) it will be held prior to, and during the GFMD, kicking off on October 22nd and going straight through the 30th. Advocates from the National Network of Immigrant and Refugee Rights are in Manila, joining in on the protests, marches, speakers and workshops. You can read all about their experiences at their blog, Migrant Diaries. Also be sure to check out their YouTube channel, to see videos from the events. Below is a video of a the opening march of the PGA on October 22, in Manila. 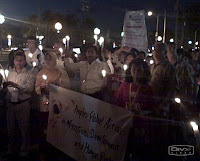 The People’s Global Action on Migration, Development and Human Rights (PGA), reached its programmatic climax with a candle-light protest march and the global opening ceremonies this past Saturday evening, and convergence workshops, reporting, and adoption of its Joint Declaration on Sunday. What was particularly unique and inspiring about these days, was the convergence of migrant groups with labor unions, struggling side by side together. Just like back home in the U.S., the relationship between these movements in other parts of the world and especially in Asia, have been tenuous at best, and more often, opposed. But here, we have come together in the PGA, found common ground in our principles, and have joined forces to challenge the Global Forum on Migration and Development (GFMD) and what it stands for. It is exciting to see such inspiring comittment and work being dedicated to migrant rights worldwide. It helps to give me a feeling of interconnectedness and of international relevance, during this highly politically charged time in the United States. We are not only fighting for immigrants rights here, we are fighting for them everywhere. Migrant Rights are Human Rights.